No Website or blog especially an e-commerce site is complete without providing a way for customers to contact the Website owner. Luckily, this is an easy task to accomplish. 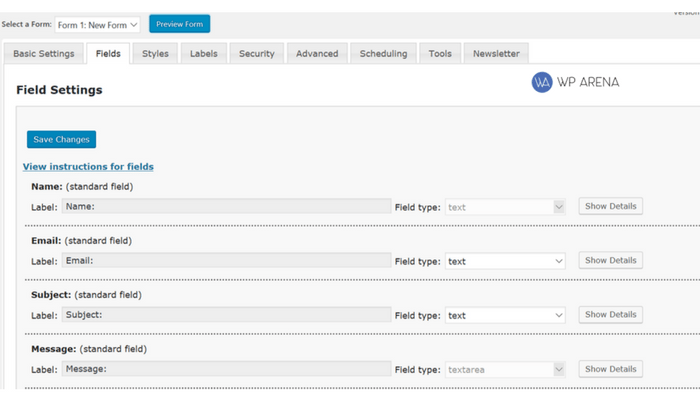 Some WordPress themes already contain a “Contact” page template. If your theme does not have one, there are a multitude of plugins that can add the functionality of contact form with only a click or two. The main reason for having one is that if there are any legal issues, there is an easy way to get in touch with you and not going through finding your web host to get your personal data for the contact. Also, let’s say a blog post is outdated and you want to notify the admin, send an email to the post can be updated. This blog post will talk about some contact plugins we stand behind. Certain plugins you use may have a way to incorporate your autoresponder with it. I know our subscription service MailChimp does this on certain plugins. Be on the lookout for this option in any plugin. After installation of the Fast Secure Contact Form, in your wordpress dashboard navigate to the “settings —> FS Contact form” link to create the contact page. After going through all the settings and I mean there are a lot, save changes, grab the shortcode. Create a new “page” and paste the shortcode in there to create a Contact Us page. If you require more than a single contact form on your site, consider the Contact Form 7 plugin. It supports multiple forms, basic customization via simple markup language, CAPTCHA support, and spam filtering via Akismet. Usage is similar to the Fast Secure Contact Form. To add a new form, create a new page (not post) and add the following shortcode tab like we did in the above plugin. The cforms is a powerful and featured rich form plugin for WordPress. This plugin offers both convenient deployment of multiple Ajax driven contact forms throughout your blog or even on the same page. cformsII did not disappoint me and shouldn’t disappoint you. It’s a light weight plugin with not a ton of baggage. The plugin was discontinued but forked and now it is back getting improvements. The above list of three free contact forms plugins contains the most popular ones we found easy to set up. By installing one of them, you can easily setup a contact us page. Hope, you liked our collection of Contact form plugins. If you feel we missed something special, then worry not. We update our lists regularly, just leave a note below in the comments section. If you are a plugin developer and have a similar plugin, Get In Touch with us.